Most of us know that we’re not exactly being healthy when we treat ourselves to snacks at the cinema, but our findings reveal that you could be consuming a lot more fat and calories than you imagine. I find it so hard to resist popcorn on a visit to the cinema – without it I feel like I’m not getting the whole experience. But after our testing revealed that regular-sized popcorn could contain more than half the calories a woman should have in a day, I’m racking my brain to think of an alternative treat. We visited a cinema from each of the three main chains: Cineworld, Odeon and Vue, and bought a regular/medium-sized sweet popcorn, salted popcorn, a coke, nachos with cheese and jalapeno peppers and a hotdog with ketchup and mustard. We then packed it all up and sent it off to a lab for nutrition testing. Our results revealed a sweet popcorn that contained 1,260 calories and 79.6g fat – this is way more calories and fat than in a McDonalds Big Mac and large fries. A woman should have 2,000 calories and no more than 70g fat a day, a man 2,500 calories and 95g fat. So, this is an enormous amount of calories and fat, especially when you think that this would be a snack or treat on top of your usual meals. Combine this with a medium coke and as a woman you would have consumed more than 75% of your daily calories. The other two sweet popcorns contained around 720 calories. One of the three nachos we tested contained 1,030 calories and more than half the maximum amount of salt an adult should have in a day (6g). 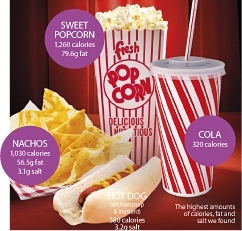 Although this was just a snapshot it showed how much the calories can vary between the same items at different cinemas. It also showed how many calories you can unwittingly consume. Odeon does produce a leaflet containing nutritional information but this was not on show or promoted and we had to ask for it. With many restaurant chains putting calorie information on their menus from September we think cinemas should do the same. Of course, it’s nice to have a treat but when some of these foods contain so many calories and such high levels of fat and salt, I for one would rather know what I’m getting. Then if I still choose to eat it, at least I’m making an informed decision. I’m still no closer to finding a healthier cinema snack, my husband laughed when I suggested grapes. I could make my own popcorn at home but our cinema states you’re not allowed to take your own food on to the premises. Any ideas? How old is your mobile phone? Brand new – less than a year old. Still quite new – 1 to 2 years old. Getting on a bit – 2 to 4 years old. 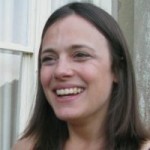 Old – over 4 years old. Do you go to the cinema everyday? 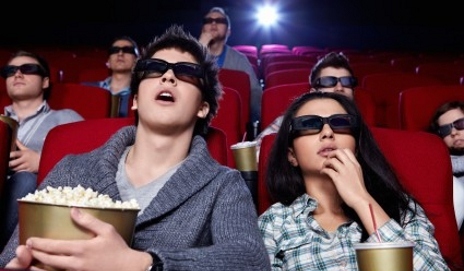 Do you consume the same amount of other foods after gorging on cinema treats? Unless you answered yes to both questions this is just an article designed to induce guilt for having a little fun. If you did it once a week that tub of popcorn would cause a weight gain of over 1 stone, which doesn’t seem so trivial! Ok so you might not go to the cinema once a week but it all adds up! I was thinking the exact same thing! Unless you go to the movies every day and consume this type of caloric food on a daily basis, why feel guilty over the calories on an occasion out? Surely it’s the same argument for all unhealthy store bought products. And the last time I checked, the ticket holders at the cinema weren’t shoving the high calorie treats down your throat… just have some portion control if you are worried about the calories consumed! I also think personally Cineworld, Odeon and Vue and all other cinemas should be the ones feeling guilty making us pay such high costs for these treats, not us to made feel guilty for enjoying them on a night out! Going to the cinema has turned from being an under £10 night out to £20 or more for a movie, soda and popcorn, and that’s before even treating a date! … but don’t get me started on that. What size popcorn are these stats reflecting? Hi Lynn, the popcorn was medium/regular size portions. There is a possibility that if we were informed of the amount of calories, salt and fat in “cinema” food and what proportion these amounts represent, we might be tempted to buy the small portion instead of the regular or especially the large. I think that a cinema stating that taking one’s own food isn’t allowed is completely out of order! Like CMF0530 I think that the money charged for the treats is far too high. I used to buy a (small!) packet of M&Ms at the grocer’s round the corner before going in the cinema. Nobody was going to check where I’d bought it when the lights were out. I would stick the grapes in a tupperware box, Shefalee, and only wait until the lights go out before you open it. And if you get caught, write to your local paper about it. If this happened in Edinburgh the Evening News would love to hear about it and the cinema would be shamed into changing its rules, or at least bring the price of the cinema food down, and perhaps offer healthier options beside all the junk? Agreed, cinemas need to be forced to offer some healthy options, just like the fast food outlets are. My main gripe though is the price. As a result I buy whatever I want to eat in a shop beforehand and take it in with me. If I am charged £18.50 for 2 people to see a film (inclusive of “debit card tax”) then I will not spend anymore money with them. The cinemas will never reduce their food prices, and quite frankly, as said before, I’m not forced into buying the high priced food, so I don’t. I am glad though, that others do buy it and that when they do, the Cinema makes a huge profit, because without the extortionate food prices I’d be pretty worried about their chances of staying open. I’d rather that it was the optional extras, as it were, that were high in price rather than the tickets. They have to make their money some how, and it really is an either/or situation. Our independent cinema is happy with you taking your own sweets in, top ticket price is £6, cola is 90p to £1.30 and popcorn £2-£4. Ice creams are the same price as the local supermarket. Unfortunately it is struggling to make money !! Are we denied some fun? Going to the cinema is fun and a treat. Counting calories on such an occasion is the last thing we do. Do all those people who want calories displayed do the same when they go to a good restaurant where most food is prepared using butter, cream and alcohol? It is time that we stop talking about calories, may be that will reduce people getting fatter by the day. Nothing else seem to work. Somehow I don’t think a salad bar will go down with punters buying tickets at the Odeon to see the latest Vampire movie, no. i know this thread is old but do you remember what the nutritional profiles of the salted popcorn varieties were? I think many of the people commenting on here are missing the point. It has gone from being about treats to being about price and that was never what this article was about. If you wanna treat then have one. If you are that concerned my food prices and ticket prices the simple answer is dont go, dont buy tickets and dont buy food, that way you wont have to worry yourselves about these” huge prices”. I would love a ferrari however I dont want to pay the price so I dont have one, same principle applie here. I love going to the movies and to be frank there isnt alot you can do with £20 these days anyway, so a good movies, some nice treats is money well spent. Enjoy your movies, especially the tight people on here. Black Mirror: is interactivity the future of TV?